The Fluffy DeathBot is a Mouse DeathBot with a blueprint skin applied. To honor spirit of our loyal hunters, the Deathbot has a new paint job, to give it some extra frills and flower power! Obliterate mice the cute way... you know you want to. The Fluffy DeathBot is not sold by any Trapsmith. It can only be crafted given the proper ingredients. 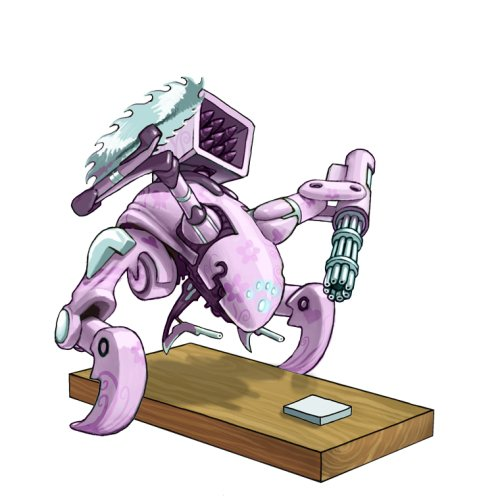 11 November 2010: The Fluffy Deathbot was introduced with the start of the King's Giveaway event. 23 September 2011: The trap skin system was overhauled and the Fluffy Deathbot Skin was changed to the Fluffy DeathBot Blueprint.